PTO stands for Parent Teacher Organization. The Millennium Elementary PTO is a membership organization dedicated to creating, maintaining and supporting a healthy and successful environment within the Millennium community. We strive to support staff, students, and their families in the quest for an excellent education. The PTO works to build the Millennium community of parents, students, teachers, care givers, relatives, neighbors and others that care about the welfare of our children. We do this through enrichment activities, event planning, fundraising, and communicating between parents and administration. Would you like to become a PTO committee chair or board officer? 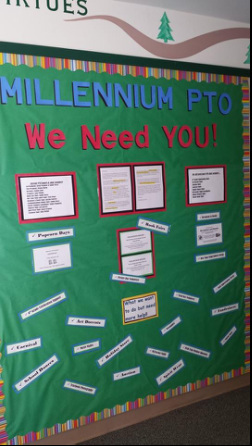 If you have been looking for a way to get involved with the Millennium PTO, but are not sure how to begin, now is the time! We have been filling positions for the 2015-16 school year. If you or someone you know is interested in serving as a committee chairs or board officers, please let us know. Many positions are available or can be shared. Feel free to contact us at millenniumpto@gmail.com for more information on volunteer opportunities. Your help is wanted and needed. Thank you. I Want to be a PTO Member, too! Membership in the PTO is easy...everyone is a member! It's about the opportunities to participate at Millennium. Please click on the Volunteer tab above to find out about current volunteer needs. Currently, we are not requiring a paid membership; however, donations are gladly accepted and appreciated.